American Idol ended a 15 year run last week. And what a run it was. Time magazine has called it "the show that won contemporary culture." 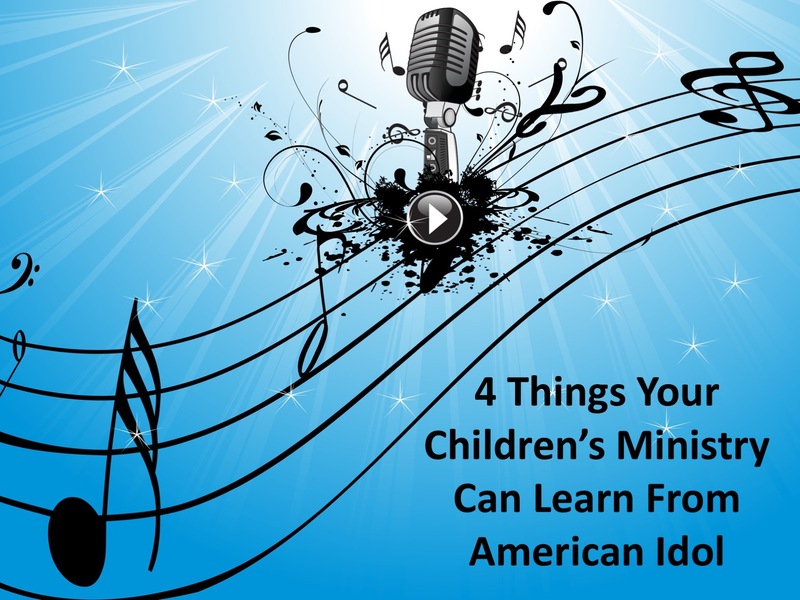 There are many things children's ministry can learn from the success of American Idol. Here are 4 of them. The power of a person's story. Idol took time to provide the background stories of the singers. This resulted in a relational connection that endeared viewers to the people on the show. Think about how this could be used in your children's ministry. Perhaps it's exposing kids not only to the victories of people in the Bible, but also to their struggles, disappointments and challenges. Perhaps it's sharing with kids that you walked through many of the things they are facing when you were a kid as well. Connecting kids to your story and the stories of people in the Bible will draw them in. Idol showed us the impact one person can make when they follow their dream. We all dream of making a significant impact and leaving our mark on the world. We were able to do this vicariously through the singers we were pulling for. We watched people no one knew suddenly become famous. As you share the stories of people in the Bible that God used, you can show kids that God can also use them to make a significant, eternal impact as they follow His plan for their life. Idol had the right people in the right places. From Ryan Seacrest hosting to judges who were purposely chosen with varying personalities, Idol made sure the people chemistry clicked. The same is true in children's ministry. From greeters to teachers to small group leaders to staff to nursery volunteers, it's important to have people in their areas of giftedness and passion. When you do this, things will begin to click. Your turn. What are some other things we can learn from American Idol? Share your thoughts with us in the comment section below.